If I understand Mr. Chastain’s situation, he sold out about half way through the market decline, he likely missed a good part of the ensuing market run-up, and now he’s bulking up on stocks 5+ years into the market rally. I sincerely hope this all works out for him. Part of the rational cited in this article and elsewhere is that stocks appear to be the only game in town. At one level it’s hard to argue. Bonds appear to have run their course and with interest rates at record low levels there is seemingly nowhere for bond prices to go but down. Alternatives, the new darling of the mutual fund industry have merit, but it is hard for most individual investors (and for many advisors) to separate the wheat from the chafe here. But a 68 year old retiree with 80% of his retirement investments in stocks is this really a good idea? I’m not advocating that anyone sell everything and go to cash or even that stocks aren’t a good place for a portion of your money. What I am saying is that with the markets where they are investors need to be conscious of risk and at the very least invest in a fashion that is appropriate for their situation. 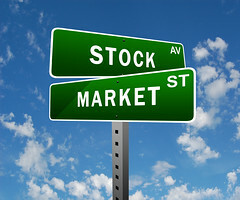 With the stock market flirting with all-time highs and in year six of a torrid Bull Market I’m guessing things are a bit riskier than they were on March 9, 2009 when the S&P 500 bottomed out. Let’s say an investor had a $500,000 portfolio with 80% in stocks and the rest in cash. If stocks were to drop 57% as the S&P 500 did from October 9, 2007 through March 9, 2009 this would reduce the size of his portfolio to 272,000. Not devastating if this investor is 45 years old with 15-20 years until retirement. However if this investor is 68 and counting on this money to fund his retirement this could be a total game changer. Let’s further assume this occurred just as this investor was starting retirement. Using the classic 4% annual rule of thumb for retirement withdrawals (for discussion only retirees should not rely on this or any rule of thumb), this investor could have reasonably withdrawn $20,000 annually from his nest egg prior to this market decline. After the 57% loss on the equity portion this amount would have declined to $10,880 a drop of 45.6%. Assuming this retiree had other sources of income such as Social Security and perhaps a pension the damage is somewhat mitigated. Still this type of loss in a retiree’s portfolio would be a disaster that could have been partially avoided. Am I saying that the stock market will suffer another 57% decline? While my crystal ball hasn’t been working well of late I’m guessing (hoping) this isn’t in the cards, but then again after the S&P 500 suffered a 49% drop from May 24, 2000 through October 9, 2002 many folks (myself included) felt like another market decline of this magnitude wasn’t going to happen anytime soon. I agree with those who say investing in bonds will likely not result in gains over the next few years. But given their low correlation to stocks and relatively lower volatility than stocks, bonds (or bond mutual funds) can still be a key diversifying tool in building a portfolio. When I read an article like the Wall Street Journal piece referenced above or hear “experts” advocating the same thing on the cable financial news shows I just have to wonder if investor’s memories are really this short. Individual investors are historically notorious for their bad market timing. Is this another case of bad timing fueled by greed and a short memory? Are you willing to bet your retirement that the markets will keep going up? Or perhaps you think that you might be able to get out before the big market correction. Perhaps you should consider doing some financial planning to include an appropriate investment allocation for your stage of life and your real risk tolerance. It seems like every time we hit new highs in the stock market, the pundits tell us that somehow it’s different this time. In 1999 we didn’t need to worry that many of the high-flying tech stocks had no balance sheet or even a viable business plan behind the company. We all remember how that turned out. In 2007 Wall Street couldn’t securitize questionable mortgages fast enough. Mortgages and real estate were very secure investments. Again we recall how that turned out. This year the markets are again reaching record highs. Both the Dow Jones Industrial Average and the S&P 500 stand at record levels as I write this. No worries say the experts. Valuations are reasonable and this isn’t a bubble (translation, it’s different this time). We don’t know how this will turn out, but hopefully those of you with any degree of common sense will recall and apply the lessons of the past 15 years. Day after day there are guests on CNBC and similar programs touting stocks. The chief investment strategist of a major financial services firm recently dismissed any talk of a bubble in stocks at least in the near term. These folks may be right; perhaps this almost five year old bull market still has a way to go. But somewhere in the back of my mind I also have to wonder if they aren’t touting stocks because it is in the financial interests of their firms (and perhaps their annual bonuses) for investors to keep investing in stocks. So what should investors do in this stock market environment? Step back and review your financial plan. Where do the recent gains in the stock market put you relative to your goals? Does your portfolio need to be rebalanced back to your intended allocations to stocks, bonds, cash, etc.? Review your asset allocation. Is it still appropriate for your situation? Review the holdings in your portfolio. In the case of mutual funds and ETFs, how do they compare to their peer groups (for example if you hold a large cap growth fund compare it against other large cap growth funds)? Would you buy these holdings today for your portfolio? Ignore the market hype from the media and from financial services ads. If you don’t have a financial plan in place this is a great time to get this done. Remember the lessons learned from the market downturns of 2000-2002 and 2008-2009. While your portfolio will likely sustain losses in a major market downturn or even a more moderate and normal sell-off, diversification helps. Diversified portfolios fared far better than those that were overweight in equities during the decade 2000-2009. Portfolios with a diversified equity allocation generally fared better than those heavily weighted to just large cap domestic stocks that use the S&P 500 as a benchmark. Of note, bonds have been a great diversifier in the past, especially over the past 30 years with the steady decline in interest rates. With rates at historically low levels at the very least investors may need to rethink how they use bonds and what types of fixed income products to use in their portfolios. My point is not to imply that a market correction is imminent or that investors should abandon stocks. Rather the higher the markets go, the greater the risk of a stock market correction. Make sure your portfolio is properly allocated in line with your financial goals and your tolerance for risk. Many of the investors who suffered devastating losses in 2008-2009 were over allocated to stocks. Tragically many couldn’t stomach the losses and sold out near the bottom, booking losses and in many cases missing out on the current market gains. Revisit your financial plan and rebalance your portfolio as needed. Most of all use your good common sense. It’s not different this time regardless of what the experts may say. The Dow Jones Industrial Average has hit something like 30 new highs this year alone, the S&P 500 is near record levels as well. Twitter just went public and Obama Care will go into full swing in 2014. What does any of this mean to you as a 401(k) investor? Here are five 401(k) investing tips for this or any market environment. If you’ve let your holdings run it’s quite likely that your account is over allocated to equities given the strong showing the stock market has made so far in 2013. This would be a good time to look to rebalance your account back to the original allocations that you had intended. Paring back on stock funds might seem counterintuitive, but essentially you are taking some of your gains off of the table in order to keep the risk associated with your overall portfolio in line. If you are just starting out in the workforce, it’s likely that your 401(k) is your lone investment vehicle. By the time you get to your 30s or 40s and beyond it’s likely that you’ve switched jobs several times and have left a number of old 401(k) accounts or IRAs in your wake. If you are married and both working multiply this financial clutter by two. Consider consolidating your old 401(k) accounts either in a rollover IRA or into your current employer’s 401(k). Looking after a number of scattered accounts is counterproductive and makes viewing all of your investment holdings as a consolidated portfolio that much harder. While we are on the subject, ALWAYS view your 401(k) account as a part of an overall consolidated portfolio. I create a spreadsheet for each client to do just that, with all of the technology available today this is not difficult, but it may take just a bit of time to lay things out the first time you do it. The reason for this approach is so that you view your overall asset allocation and the diversification of your portfolio across all investment and retirement accounts. Are you taking too much risk or not enough? Do you own the same fund in three accounts all in different share classes? This is the time of year where many companies have their employees go through Open Enrollment for their employee benefits. While you are thinking in terms of benefits this is a good time to boost your salary deferral to ensure that you are contributing the maximum to the plan. If you can afford it and are not on track to max out for 2013 ($17,500 and $23,500 if you are 50 or over) arrange to have more withheld for the rest of this year and figure out what percentage to apply to your first check in 2014. How you invest your 401(k) is important, but studies have shown that the amount you save for retirement is the biggest single factor in determining the size of your nest egg. One of the Target Date Funds offered by your plan might be the right choice for you. This may be the fund with the target date closest to your anticipated retirement date or some other fund in the series. It is important that you understand what is under the hood of the Target Date Funds and decide if this is the right approach for you. Note these funds change from time-to-time as witnessed by some recently announced changes that Fidelity will be making in its Freedom Funds. Many plan sponsors are offering advice options ranging from online advice to one-on-one advice to managed accounts. Check out these options and any fees associated with them. If you work with a financial advisor make sure that they are providing you advice on how to allocate your 401(k) account along with the advice they provide on your other holdings. Some 401(k) participants are savvy investors, others are not. If you are in this latter camp, bite the bullet and hire the advice that you need. This is important, it’s your retirement, and you only have one shot at it. For better or worse the 401(k) and similar retirement plans are the main source of retirement savings for most of us. Make the most of your plan regardless of what is going on in the markets or the economy. As I write this the Dow Jones Industrial Average and the S&P 500 stand in record territory. In fact yesterday the S&P finished above 1,700 for the first time ever. Bonds on the other hand have started to fizzle with virtually all bond categories suffering a loss during the second quarter. If you watch CNBC or similar shows the bulk of the guests are encouraging investors to get into stocks even at these high levels. I’m not saying that new money invested in stocks will turn into losses, but I am saying that record market levels are not a reason to suddenly become euphoric about stocks. As you review your statements look at your portfolio’s current asset allocation to see if the gains in stocks have gotten you away from your target allocation. Certainly market highs are a good time to look at rebalancing your portfolio. Additionally this might also be a good time to review your target allocation in the context of your financial planning goals. Have the gains in the stock market put you ahead of schedule in terms of reaching financial goals such as retirement and college funding? Perhaps it’s time to take some risk off of the table and adjust your allocation to stocks a bit lower. In any event this is a great to review your financial plan if you have one or to get one in place if you don’t. Bonds and bond funds have operated in a favorable environment for the past 30 years. This changed in the second quarter, though things have recovered a bit in July. None the less at some point we will see interest rates rise. This is a good time to look at your bond and bond fund holdings with and eye towards perhaps shortening up on duration. Mike Piper offers A Look Inside Vanguard’s International Bond Funds at Oblivious Investor. Ken Faulkenberry explains the difference between Geometric Average vs. Arithmetic Average For Investment Returns? at AAAMP Blog. Morningstar’s Christine Benz walks us through A Bucket Portfolio Stress Test. Market Watch’s Brett Arends comments on The return of ‘Dow 36,000’. Jon shares Stock Basics: The P/E Ratio at Novel Investor. Please feel free to contact me at 847-506-9827 for a free 30-minute consultation to discuss your investing and financial planning questions. All services are offered on a fee-only basis, no financial product sales, no commissions. Please check out our Mutual Fund Investing page for links to additional posts about mutual fund investing.